September 27, 2007, Greencastle, Ind. - [Download Video: "The 20s" - 844kb] "In your 30s, 40s, 50s, 60s, you have more judgment and experience and, hopefully, wisdom. 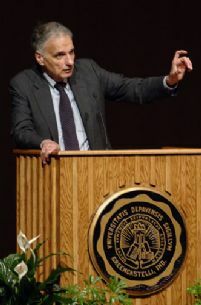 But the breakthrough, the pioneering initiative, the great idea, the resolve starts in your 20s," activist and three-time presidential candidate Ralph Nader told students at DePauw University tonight. "It has roots earlier, to be sure. But it starts in your twenties," Nader added. He presented a Timothy and Sharon Ubben Lecture, "Don't Waste Your 20's! 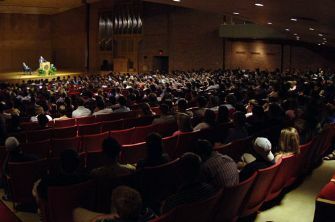 Your Most Creative Decade," to approximately 1,100 people in the Green Center for the Performing Arts' Kresge Auditorium. 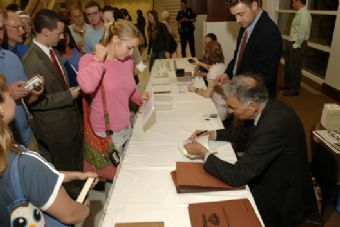 Nader, recently named "one of the 100 most influential figures in American history" by Atlantic Monthly, urged undergraduates in the audience "to have a higher estimate of your own significance and the kind of impact you're going to have on society." He recalled how his research in law school prompted him to begin a campaign to improve the safety of automobiles, which led to his 1965 bestseller, Unsafe at Any Speed, and a year later, Congressional passage of the National Traffic and Motor Vehicle Safety Act. 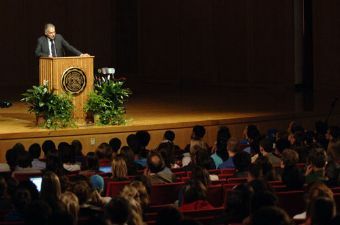 Nader called on DePauw students to leave college with a firm grasp of history "and the valiant people who preceded you and who didn't make excuses for themselves." Recalling those who led the anti-slavery movement, pushed for the right of women to vote, and the industrial labor movement, Nader asserted, [Download Video: "Zero Power" - 789kb] "All of these people started these social justice movements with zero power. Zero power is no excuse. Every social justice movement starts with people who have zero power, but they make power by the power of their beliefs, their value systems, their persuasion, their reaching out and locking arms with other people." 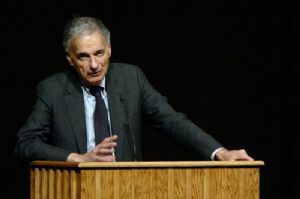 Also honored by TIME magazine as "one of the 100 most influential Americans of the twentieth century," Nader says on many college campuses there is a "disconnect between words and deeds." While students may take offense to certain words or phrases, they're less likely to stand up against actions they find objectionable. Whether their quibble is with political leaders, the war, the environment, social inequality or any number of other issues, the attorney and activist urged students to rise and make their voices heard. He emphasized that an individual can make a difference, and that youth is fleeting. [Download Video: "Tick... Tick" - 574kb] "You're only about 15,000-plus days from being 65, a little over 2,000 weeks. Did last week go quickly," Nader asked to an audience which responded with nervous laughter. "You haven't seen anything yet, ask your mother and father and grandparents. It goes very quickly." 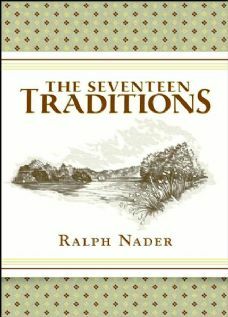 Recently the subject of the critically acclaimed documentary, An Unreasonable Man, Ralph Nader's latest book is the introspective The Seventeen Traditions, about the earliest days of his own life and the lessons he absorbed from his parents, his siblings, and the people in his community. 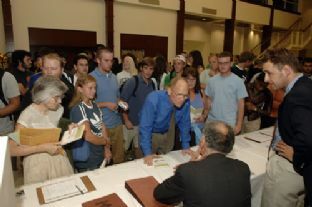 Nader, who received two standing ovations during his speech, signed copies of the book in the Great Hall of the Green Center after his Ubben Lecture. He was still autographing and answering questions an hour after stepping off of the stage. During his remarks, Nader asked his audience to ponder a question. [Download Video: "A Real Moment of Truth" - 1312kb] "What are you going to say when that nine-year-old granddchild sitting on your knee looks at you having just sort of developed a global awareness, and asks you, 'What were you doing when this terrible situation was getting under way, or that environmental tragedy was getting underway?' What are you gonna tell them? You were busy filling out your profile on Facebook? You were watching the second rerun of Friends? That is a real moment of truth, you know." 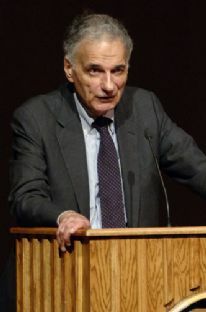 Nader's speech also touched on a range of issues, including what he sees as the undue power of American corporations, how we as citizens own the airwaves and public lands and have subsidized research and development that are often given away to corporate interests, that one-in-three Americans make less than $10.50 an hour, and that about a quarter of the amount of money spent on the war in Iraq last year would pay the public tuition of every college student in America. "The one institution in our country that can turn our country in proper directions is the U.S. Congress -- 535 men and women who put their shoes on every morning just like we do. Corporations have a lot of power, but they don't have a single vote. We have the vote, we have the numbers, and we have the determination if we can equip ourselves with it," Nader said, as he called upon the audience to be proactive in letting their representatives know their votes are being monitored. Instrumental in creating the Occupational Safety and Health Administration (OSHA), the Environmental Protection Agency (EPA), and the Consumer Product Safety Commission, Ralph Nader also helped draft and pass laws including the Safe Drinking Water Act, the Meat and Poultry Inspection Rules, the Air and Water Pollution Control Laws and the Freedom of Information Act. He's also formed a number of citizen groups, among them the Center for Auto Safety and Public Citizen. He advised the students, [Download Audio: "Time for Reflection" - 113kb] "Give yourself a chance. Develop time for yourself, by yourself in solitude. Don't overschedule yourself -- whether entertainment, work, study -- give yourself some solitude time," Nader asserted, imploring his audience to "ask the impertinent questions ... Ask yourself why you are going to vote for people you don't believe in because the people you don't believe in are not as bad as the other people." In his third visit to DePauw (Nader's previous speeches came in 1970 and 2002), the activist pleaded, [Download Video: "Embracing Civic Assets" - 1807kb] "Let not your generation be the last one that historians will describe in the following terms: That you had to give up so little to achieve so much. Remember, here at your college you have laboratories, you have your own newspaper, your own radio station, I understand your own television station, your own gathering rooms; when are you ever again going to have control over these kinds of civic assets? Take advantage of them, and when you leave DePauw, and you go out into the society, remember that given our Constitution and its elaboration and given our powerful role in the world, you're living in a country where you have the greatest potential to improve the world." He concluded, [Download Video: "A Final Message" - 648kb] "Don't look back in 15,000 or 20,000 days with regret as to what you missed, which is the great work of life on earth: the pursuit of justice." Ralph Nader's day at DePauw also included an afternoon student forum, which was moderated by two faculty members (visit a photo gallery), and a news conference with members of the University's student media. In the latter session, Nader said he continues to consider the possibility of entering the presidential race, as he did in 1996, 2000 and 2004. 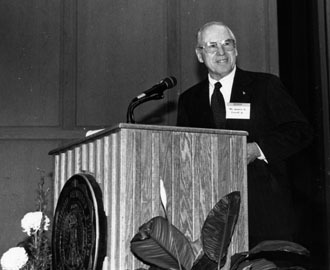 Established in 1986 through the generous support of 1958 DePauw graduates Timothy H. and Sharon Williams Ubben, the Ubben Lecture Series' visitors have included Margaret Thatcher, Mikhail Gorbachev, Shimon Peres, Jim Lovell (pictured at left), Peyton Manning, Spike Lee, Ken Burns, Willy Brandt, Gen. Colin Powell, Lynne Cheney, Mike Krzyzewski, Mitch Albom, Barbara Bush, Julian Bond, Benazir Bhutto, Rev. Jesse Jackson, L. Paul Bremer, Naomi Wolf, Paul Volcker, John Major, Elie Wiesel, Robert Gates, Gen. Wesley Clark, Ross Perot, Bill Bradley, David McCullough, Doris Kearns Goodwin, Harry Belafonte and Brian Mulroney. To view a complete list of Ubben Lecturers, which includes links to video clips and news stories, click here.